Toyota’s FJ Cruiser is a retro vehicle, inspired by its iconic predecessor the FJ40. The FJ40 was a capable off road vehicle, but offered little in the way of interior features. While clearly more sophisticated than its ancestor, the current day FJ Cruiser has remained true to early 40 series interior styling. It has a sparse vertical dash that offers limited storage and accessory mounting locations. The Outback Roof Console provides a practical location for your CB or long range radio. Positioning the radio just above the rear view mirror ensures it is clearly visible from the driving position. The microphone and cable are hooked out of the way, yet are easily reached when needed. Roof consoles arrive ready for a standard DIN size radio installation with optional sized adapters available (see chart below) . The Roof Console also increases storage options for the FJ Cruiser, through its drop down storage locker. Perfect for wallets, sunglasses, maps, mobile phones or anything else that may slide around the cabin. 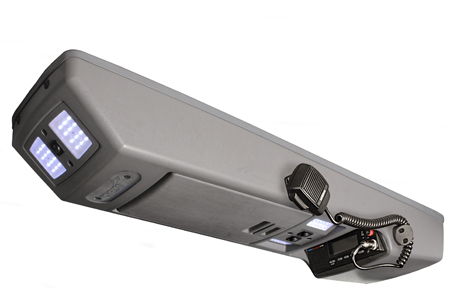 The Outback Roof Console features four banks of super bright LED interior lights. Control switches allow these to switch on when a vehicle door is opened, remain off or switched on independently. LED’s emit a brilliant white light that is easy on the eyes and effectively illuminates the cabin.